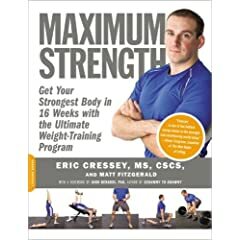 I managed to get my hands on Eric Cressey's New Book, Maximum Strength - Get Your Strongest Body in 16 Weeks with the Ultimate Weight Training Program. Today in his newsletter he featured my results from the program. If you like the content be sure to sign up for his weekly newsletter as it pertains to general fitness, sports, rehabbing injuries and the like. You can pick up his book at amazon by clicking the picture above. I believe it is available for pre-order but imagine it will be shipping soon. I'm still reading through the book as we speak (I just got my copy) and I'll post a full review upon completion. I can tell you the warm-up section alone is well worth the $13 this book will cost you.